This post was written by Emily Daniel, Rebecca Durgin, and Shayla Wheat, graduate students in the Smithsonian-Mason History of Decorative Arts Masters Program. Emily, Rebecca, and Shayla were also Graduate Research Assistants in 2015-2016 at the National Museum of American History Library. In anticipation of the thirty-first modern Olympic Games being held in Rio de Janeiro starting this week, here is a look at the type of equipment that may have been used at the first modern Olympic Games 120 years ago. The Olympics were reinstated and held in Athens in the spring of 1896. The athletic competition included both traditional and contemporary sports of the late nineteenth century. The sports from the Greek Olympic tradition included running, discus throwing, gymnastics, boxing, and wrestling. The newly added games were cycling, fencing, sailing, shooting, weightlifting, and tennis. With the onset of the Industrial Revolution, production became more efficient and automated for workers which allowed them time outside of work for enjoyment. This additional leisure time enjoyed by many Victorian people allowed participants of the 1896 games, as well as “weekend athletes,” a chance to practice with the latest sporting goods. A. G. Spalding & Bros. was founded in 1876 by Hall of Fame pitcher, Albert Goodwill Spalding. The quality equipment the company began producing in the nineteenth century continues to be a staple of sports teams around the world. 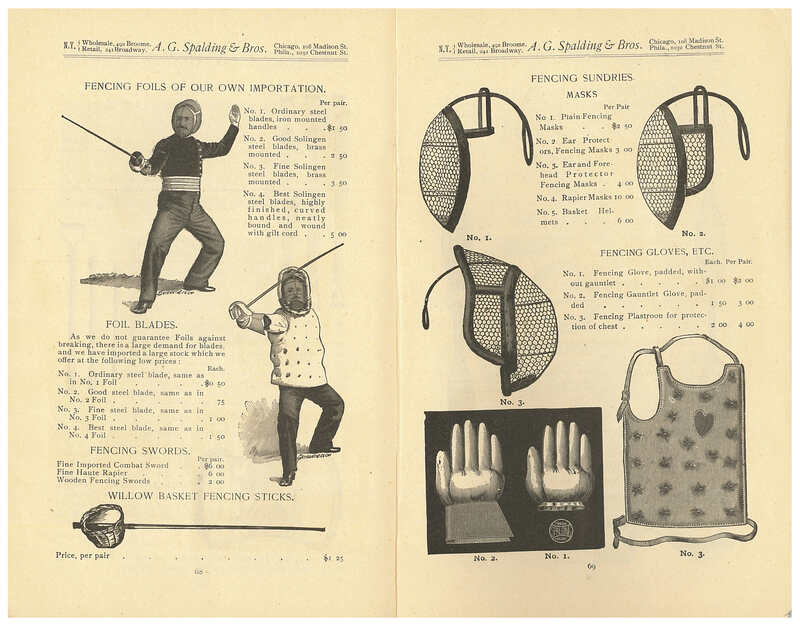 The 1892 Summer Sports Catalogue A illustrates boxing and fencing equipment, two of the sports that were featured in the 1896 Olympic Games. A. G. Spalding & Bros., Chicago, IL. 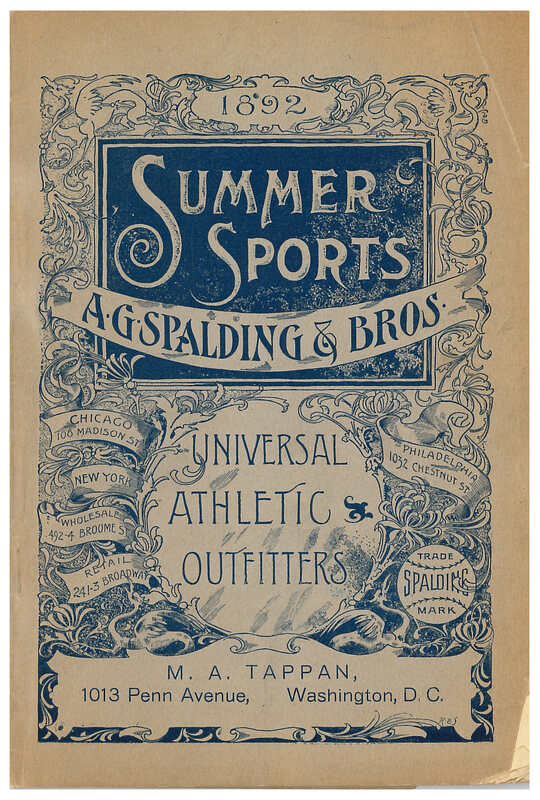 Summer Sports Catalogue A, 1892, front cover of catalog. A pugilist, or boxer, is shown training with the Rumsey Elastic Striking Air Bag. In preparation for the 1896 games, many athletes might have practiced on the latest equipment, like this, produced by Spalding or other companies. Below, the pugilist is gearing up for the next big fight in the comfort of his dwelling, demonstrating the convenience and efficiency of Spalding products. 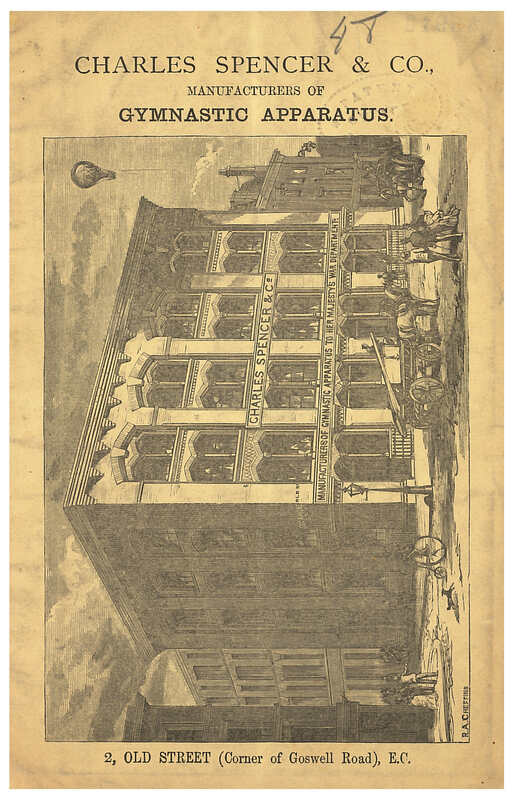 A. G. Spalding & Bros., Chicago, IL. 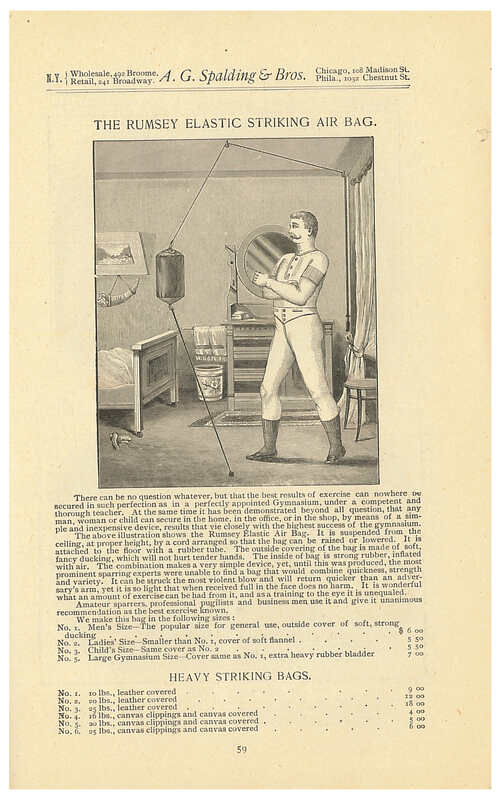 Summer Sports Catalogue A, 1892, page 59, boxer practicing on the Rumsey Elastic Striking Air Bag. The traditional European sport of fencing was inaugurated into the modern Olympic Games in 1896. Below, two fencers are pictured mid-stance showing off the latest in Spalding fencing equipment, which included fencing foils, gloves, and masks. As shown in the image on the bottom right of the “Fencing Plastroon for protection of chest,” one notable feature is the delicate heart that has been attached as a reminder to the wearer to be en garde. A. G. Spalding & Bros., Chicago, IL. Summer Sports Catalogue A, 1892, pages 68-69, fencing equipment. This 1880 John Wilkinson catalog, Archery, Lawn Tennis, Games, Home Amusements, Bicycles and Velocipedes…, offered a variety of outdoor sporting equipment. John Wilkinson, Chicago, IL. 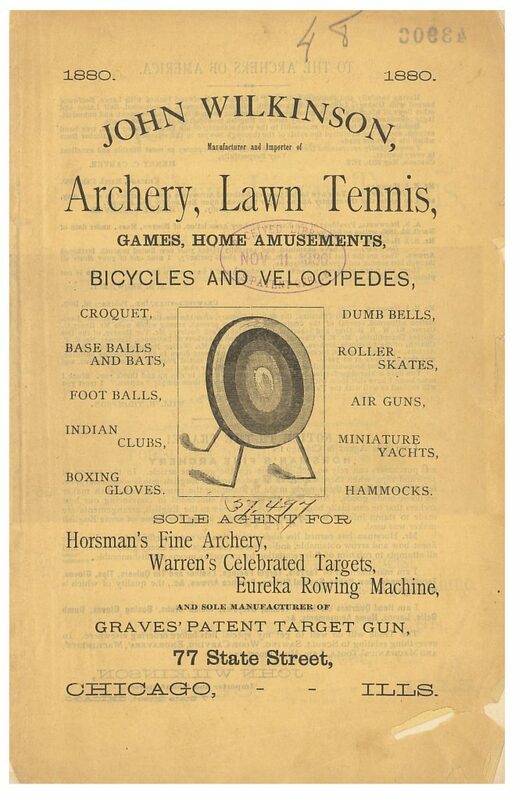 Archery, Lawn Tennis, Games, Home Amusements, Bicycles and Velocipedes…, 1880, front cover of catalog. Tennis became a widely popular game in the nineteenth century in England, then made its way to the United States. 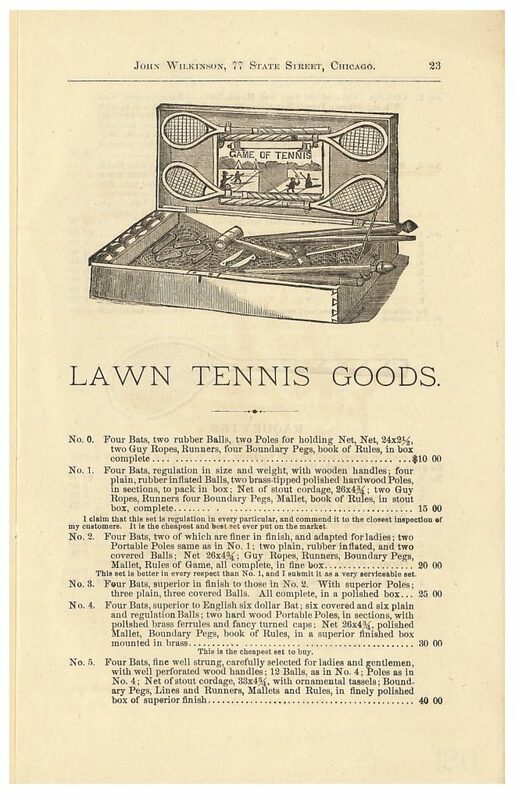 John Wilkinson sold lawn tennis sets in 1880 ranging in price from $10 to $60. 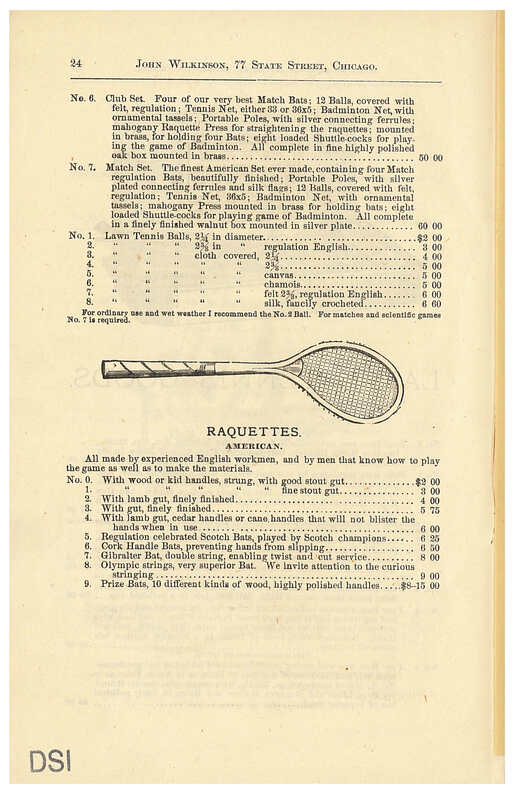 The company even sold “Olympic Strings” for raquettes that were made by experienced English workmen and players, maybe giving Americans hopes of bringing home the gold in the first modern games. John Wilkinson, Chicago, IL. Archery, Lawn Tennis, Games, Home Amusements, Bicycles and Velocipedes…, 1880, page 24, raquettes. In 1875, Charles Spencer & Co. manufactured indoor and lawn gymnasium equipment for gymnastics, which had become popular in the European markets. Some of this equipment is illustrated in this 1875 catalog, Gymnastic Apparatus. Charles Spencer & Co., London, England. Gymnastic Apparatus, 1875, front cover of catalog. The sport of gymnastics was practiced by both adults and children on the new portable and lightweight Pangymnasticon, which resembles modern day playground equipment. These movable gymnasiums included ladders, climbing ropes and poles, trapeze bars, rings, and even a see-saw. Charles Spencer & Co. also manufactured the horizontal bar which had a steel core to make sure the athlete was stable while exercising and practicing. Some of the equipment, such as the bars, balance beam, vault, and pommel horse, became standard apparatus on which gymnasts could compete for a perfect score. Charles Spencer & Co. even sold pole vaulting stands to allow early track and field athletes to train on their own lawns as well as at public outdoor gymnasiums. To make sure the athletes practiced safely, the company offered a “mattress of strong sailcloth for jumping purposes” for secure landings. Charles Spencer & Co., London, England. 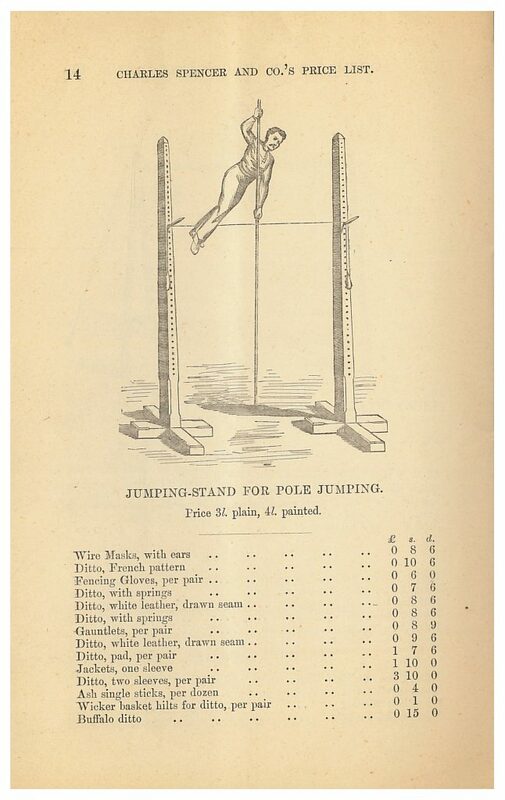 Gymnastic Apparatus, 1875, page 14, athlete practicing on a jumping-stand for pole jumping. All of this athletic equipment provided people of the nineteenth century access to exercise and an emphasis on dedicating themselves to a sport, maybe even a chance to represent their country in the first modern Olympic Games. Though athletic equipment has evolved since the nineteenth century, the love of the Olympic Games and the popularity of different sports has continued into the twenty-first century. These trade catalogs by A. G. Spalding & Bros., John Wilkinson, and Charles Spencer & Co. are located in the Trade Literature Collection at the National Museum of American History Library. Olympic.org. Athens 1896 Summer Olympics. Previous Post “Every one knows what a bird is.” Or do they?